Wednesday this week I took the day off to be at home when our large silver maple tree in the back yard was scheduled to be removed. 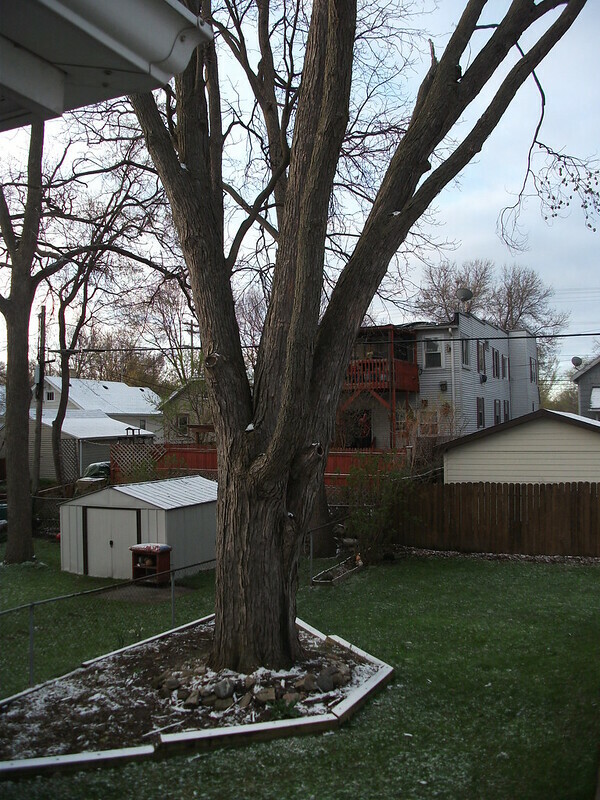 I hate to see any large tree taken down, let alone ours, but it was dying and we felt it was becoming unsafe. Part of the trunk was showing stress, rot with ants and visibly leaking sap in a stress area. The questionable segment was hanging right above the back end of the garage and gardens, also some of the upper branches, including some above the neighbor's house, had died and started to rot. So rather than wait until gravity became too much, we had it taken down safely. Many thanks to Nikolas' Tree Service! First off, yes, that is snow on the ground Wednesday morning. In fact, it spit snow almost all day. No light accumulations like what you see here from the overnight hours, but still it was snowing. Again. Actually not bad outside for late November or early December. Too bad it is late April. Secondly, if you must skip all my yadda yadda, there is a short video at the end and 28 more pictures after the break - click where it says 'Read more' at the end of this post. The crew showed up by 7:30 am Wednesday morning. I had already been up and taken the 'before' shots you see here. Getting the boom truck into the back yard was the tricky part, and probably took about 20 minutes to accomplish. They were very safe and slow, driving on plywood and putting blocks by the wood edging around the tree as to not destroy it when the tires rolled over. I was impressed by the care they took, not just in getting the truck in and out, but overall. I do not have pictures of getting the truck in because I did not want anyone to get nervous. Anything that might happen to get accidentally destroyed would have been our property, after all. I took over 140 images, including a dozen or so short videos. I decided to stay well out of their way so they wouldn't have to yell at me or worry where I was. For taking pictures I mostly stuck to just outside the back door on the landing to the front of the house for the tops of the tree. I did watch out the windows and did not try to hide it - I found watching them work pretty fascinating. They knew what they were doing and seemed like a well oiled machine. Talking to Nikolajs at lunch, however, he said how it was going slower because a control in the bucket broke the day before so he had to have one crew member at the base of the boom controlling that particular item manually. To my untrained eye it all seemed like it was supposed to be like that. One thing that happened that I should have but did not consider, is the squirrels. It all started for us on Easter Sunday 5 years ago, when we had a very long branch break off due to squirrels that made a large hole out of a small hole (probably where a branch broke off years ago - I saw a lot of holes in limbs they brought down where the old branch stub rotted, leaving a hole), and kept weakening the branch until it broke. Squirrels had probably been living in there for years, which still upsets me because we had a crew trim the tree shortly after moving in and they surely noticed but let it go. (Bastards. Nikolajs was a certified arborist. 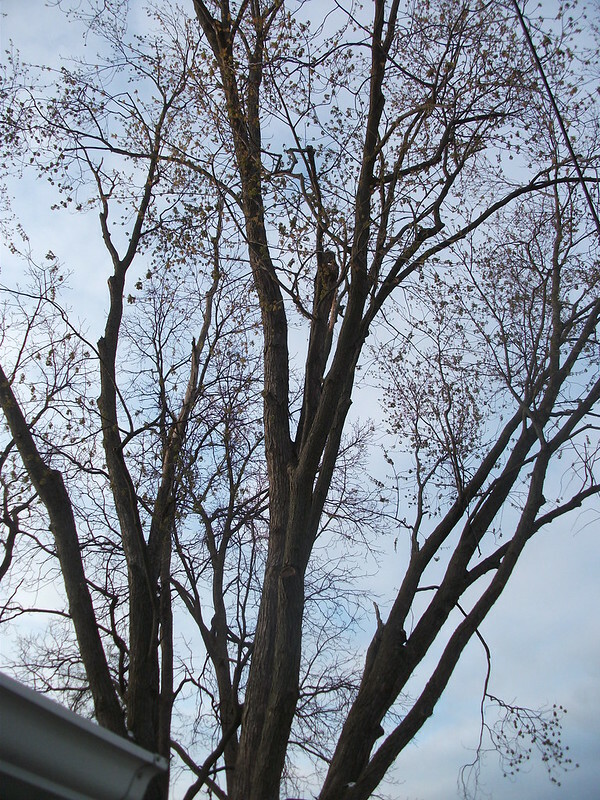 My advice if you have trees is to only hire a certified arborist - and verify insurance.) When he got to that part of the tree this mama squirrel made a mad dash away through the branches and into neighbor Dave's black walnut trees. I watched Nikolajs take down that small part of trunk carefully and vertically, and when it got down one of his guys went through the bedding carefully and found one baby squirrel, eyes still unopened. 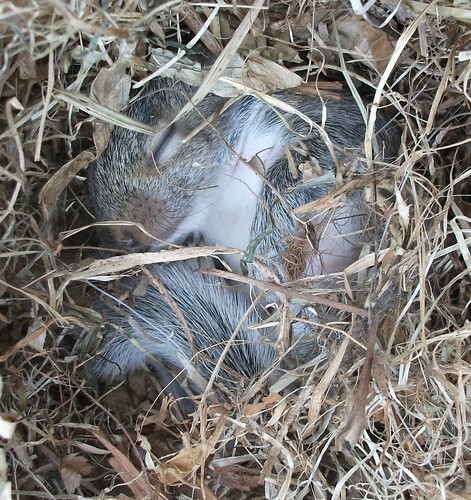 He carried the squirrel and bedding to the burning bush next to the compost bin and set him up in a little nest on the ground. I went back there while they were at lunch and got a couple pictures. While the crew was cleaning up one of the guys told me he saw mama squirrel carry off the baby over the fence. I'm sure she did because I know she did not go far and I thanked them for caring. Inside I thought: Good! I was thinking maybe we'd be raising a baby squirrel this year - I don't know how the cats would take that! Although I trusted them I kept an eye on them almost constantly, either outside taking pictures or inside looking for the next stage to go out and take more pictures - it was cold enough to be snowing, remember. And like I said, I found it fascinating to watch. I told him I was taking pictures because it would take me a long time to grow the next one! He actually appreciated it and we arranged for him to stop by the next evening for me to give him a copy of all the pictures and videos I took that day. He mentioned putting new pictures on his website and I would be flattered if he did. I'm no pro, and with our digital camera I do not zoom. If I zoomed in or if I crop to the same parameters it is the same resolution. I'd rather get the whole shot and zoom in later where I need to, if even necessary. One thing that did surprise me but shouldn't have was the sheer weight of some of the pieces of trunk even 20-25 feet off the ground. I understand why he was cutting them shorter and shorter. When one would fall to the ground you could feel it. He did that with only a few pieces, let them fall without being roped, as he got down to the trunk that was to be brought down in one last piece. Below is video of the felling of the trunk, Youtube did not give my video a thumbnail for some reason - and I tried re-uploading it twice - but the video works. I think email readers must visit the site to view the video, click here for that! And Read more below! About 8 hours of tree removal told in 28 more pictures after the break! Last night was the fourth Heritage Series event at Dexter's Pub, featuring a six course dinner and different beers with each course. We had gone to the first dinner back in January and had a real good time. The second dinner was canceled. The third we opted not to go to due to my wife was disgusted with a goose liver course - there's a fancy name for it that I forget now (I'm sure I wouldn't have eaten it either). 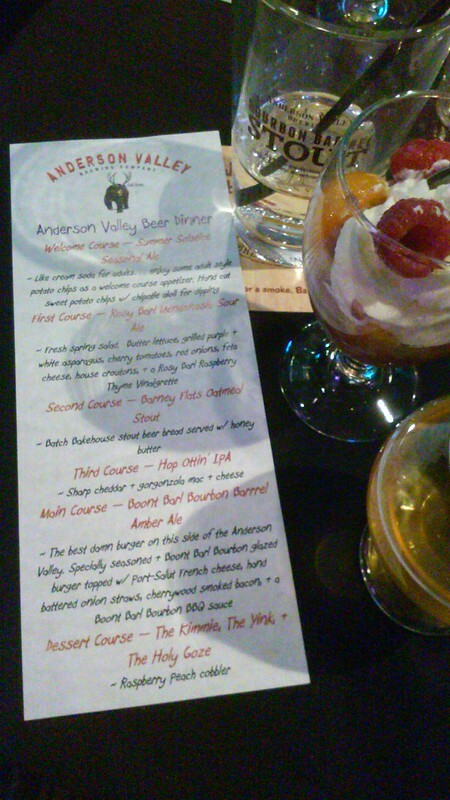 So this was the fourth dinner and featured a craft brewery from northern California, Anderson Valley Brewing Company, providing the refreshments. As regular readers know, I am normally not a big beer connoisseur, but I do have fun with this event and tasting different brews with different foods. Also, my wife and I have found we rather like the sour brews, and there were two featured with dinner. a lighter one with the first course and a much more sour one called The Kimmie, The Yink & The Holy Goze to go with dessert. The beer rep did give us some back story on the brewery and explained each brew as it was presented. The chef also came out with the courses explaining why he picked the dish to go with that particular brew. Informative and tasty, too! We had two friends along, Ted and Steve/Bob (don't ask), who are members of the local home brewer's guild and definitely know their way around a stout to an ale, IPAs to sour brews, and much more than I will ever know. Although it can be like listening to a different language sometimes, I do like listening to my friend Ted and other beer people talk beer, and I enjoy the enthusiasm they always display. So, they seemed to have a good time as well. Anyway, my wife and I had much fun for a Monday night and I was still in bed on time with no ill effects this morning (while my wife planned today off, you know, just in case!). Next month there is no Heritage Series dinner at Dexter's due to Madison Craft Beer Week and all the festivities that go with that, but June is Alaskan Brewing Company and July features the local Capitol Brewery from Middleton, WI, right next door. Honestly, the menu dictates our wanting to go to these events. Almost any craft brewery good enough to be featured will be interesting to us to try with different foods. ❄Oh, and it snowed today, Tuesday, 21 April, 2015. No accumulations, just flurries. Certainly not unheard of in this area, but it was tee shirt weather just this past weekend! It may as well have been a day in late November today. Ya gotta love Wisconsin in the Springtime! Um. Well, I don't have to love it but I gotta live with it! This is exactly why I looked for a larger top for the new cat tree. 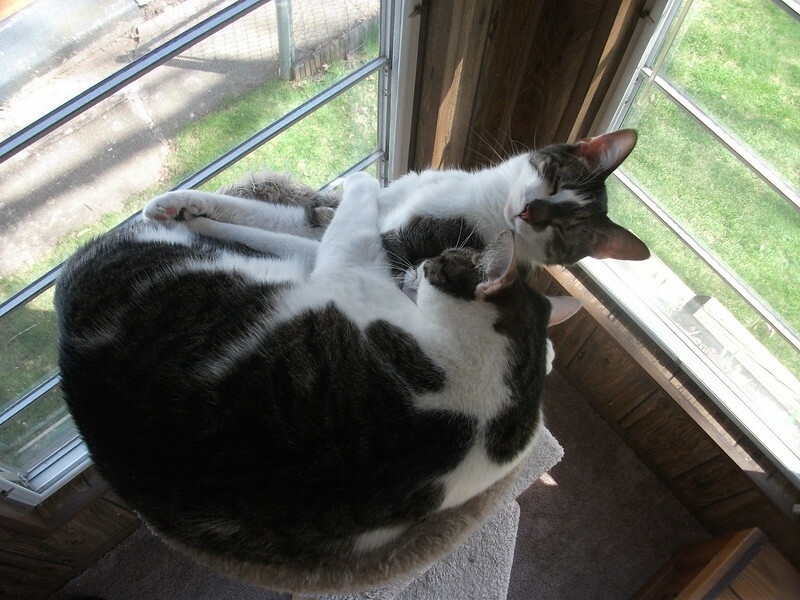 Now they have it and can both fit comfortably - and they do love the new cat tree, but I still find them on the porch, on the older cat tree stacked on top of each other. 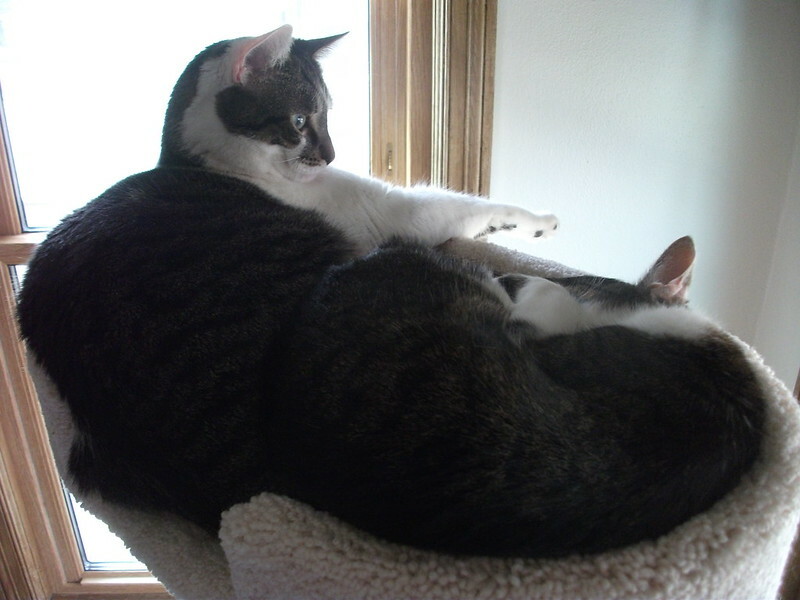 It's a good thing they are very close, being brothers. Their third birthday is Monday but they already got their present, maybe I'll just give them some treats that day. The weather has been okay and the grass is turning green finally. Plants are starting to come up and flowers have appeared here and there. Kate got some planting done in the garden today, see pictures on our garden site. Still, we are going to have overnight temperatures below freezing again early next week. I've been stressing about my long list this spring, but it is still too early for much of it. I want to be done with below freezing temperatures before I get out the power washer. All in due time, I guess. But there will be a dramatic change coming for us this week, stay tuned! I got a shot of the cats in their new cat tree for comparison. They're still tight, but at least not on top of each other! Live in New York last night to open the new tour! I've been listening to the new cd since I received it from Amazon on the US release date, March 31. I have already had them as a Latest Listening Pleasure a few times so did not want to do it again so readily, so this is just a new thing - a LLP Bonus! I came across this video of last night's show in New York to open their US tour and I wanted to post it because it is the newest live video of them since year before last festival season, and we hear the newest songs live! The new album, Endless Forms Most Beautiful, opened in the US top 40 last week. ...was my sixth blogday. Over 850 posts, with this. Um. Yeah, seems about right. Early Cat Birthday and GO BADGERS! Their official birthday is not until April 20, as far as we know, so Basil and Hamish got their gift early this year. We are still waiting on the weather to stay above freezing overnight consistently before I get started with the power washer chores outside, so since I had the time this past weekend I cut a base and assembled the new cat tree early. I also adapted an old TV turntable for one of the new lamps. It feels good to get outside and make stuff out of wood again! 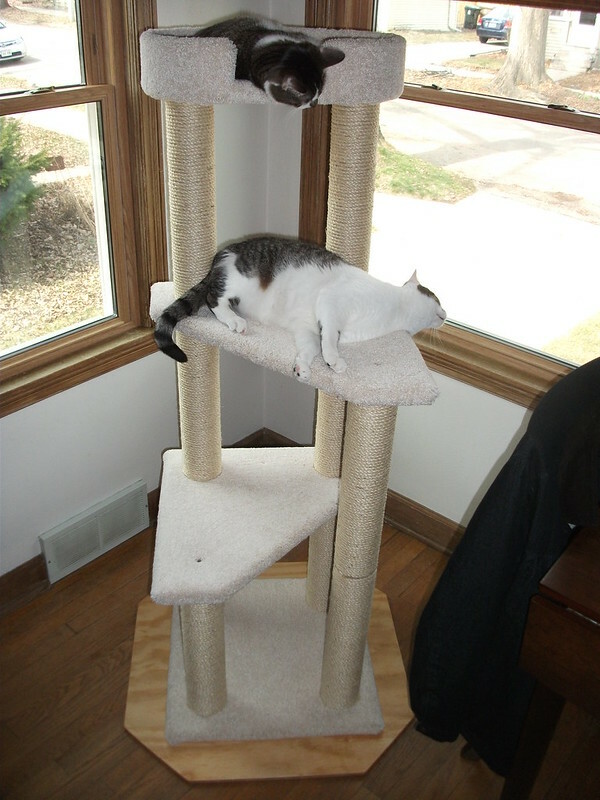 While the new cat tree is larger than the old one, it still has the same type of base, with carpet folded over the edges, so it is not as stable as I would like, especially when they get a running start at it, so I added a base to give it weight and stability. Nothing too difficult to do and it may save a window (or a cat) someday. I should have used a darker stain on the wood, that is something I can go back and redo later if I want. 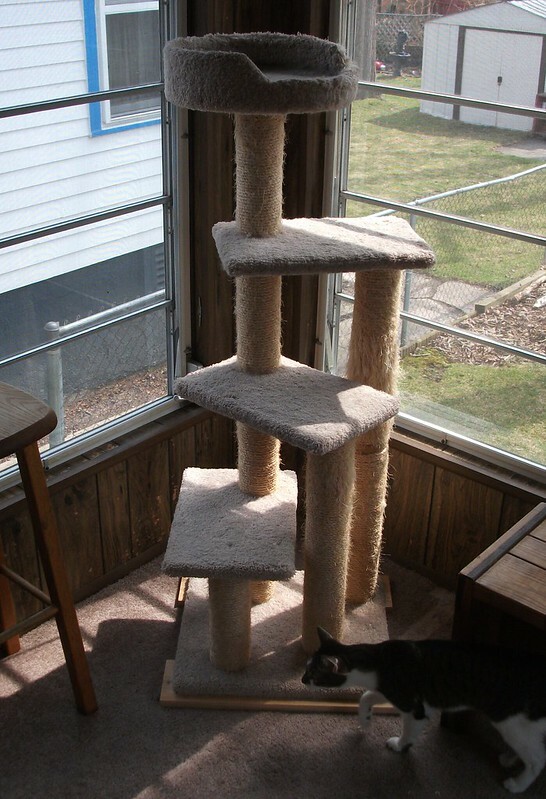 The new cat tree has one less level than the old one, but the levels are larger and overall it is about 6 inches taller. 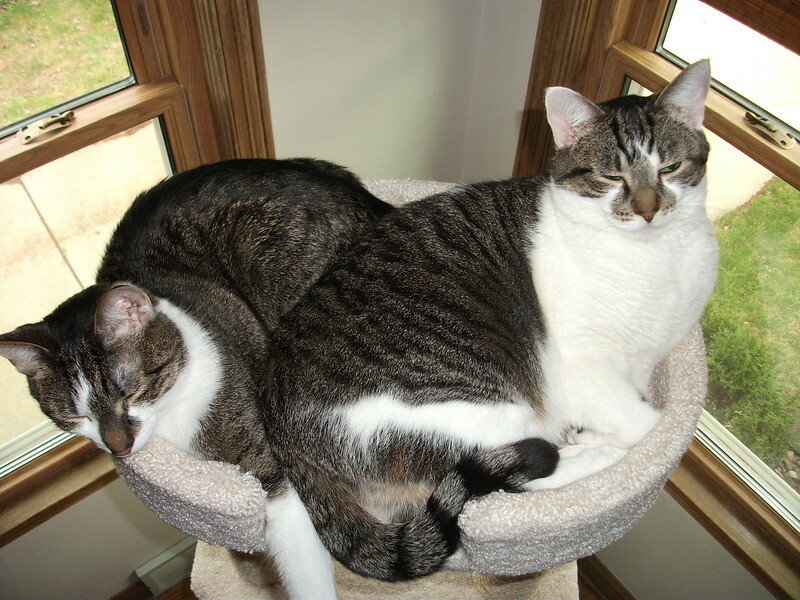 The top area is also larger than the old one so when they share the space now they will not have to lay on top of each other as much as before. Still tight on top for 2, but better than before! Also, we used to have a turntable under our old (large, boxy) television so we could turn it to face wherever we needed it to in the living room. Now we have a new, flat screen TV that is mounted on the wall so this was sitting downstairs collecting dust. I made a cardboard template of the base of the swing arm lamp to get an approximate size and trimmed down the turntable so it would fit in the corner and still turn with no problems. Now we can swing the lamp out much more easily to get at the window behind it. Not real exciting, and I did not take pictures. The old cat tree has been moved to the back porch for the summer. When we have the patio door open I can just see the cats running the length of the house from one cat tree to the other! This fall, once it is cold enough to keep the patio door shut for the season the old one will be trashed. They have had it for two years and it is getting pretty worn. Happy birthday, Basil and Hamish! Also, tonight the Wisconsin Badgers take on the Duke Blue Devils for the NCAA College Men's Basketball Championship! The Badgers beat the unbeaten Kentucky Wildcats on Saturday night, avenging last year's Final Four loss to them by one point. This team is good enough to get it done. 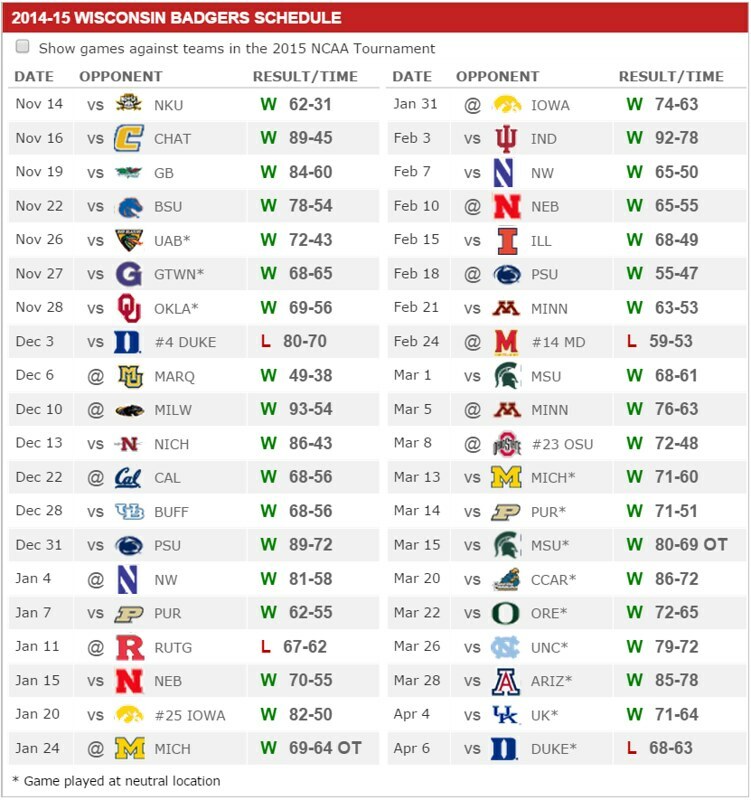 No matter what happens, it has been a wonderful season to follow the Badgers. I see no reason they will not follow through with their stated goal - and bring home a National Championship! Well, I wound up disappointing my wife in one of those ways that I should have seen coming but I'm a man therefore stupid blind to all hints and unable to understand the simplest gestures until all is lost and apologies are even a last ditch, lame sounding, even-I-don't-believe-me pathetic gesture. My lovely wife wanted to spend our rare afternoon off together making a short round of our favorite bar/restaurants and have an appropriate drink and appetizer/food item at each place. I don't eat much during the day so did not have much of an appetite when we started out, and well, my lack of appetite at the time made my wife not order anything and it just did not turn out like she wanted. I went about it too casually and should have looked at our time this afternoon more like a date. By not doing so, I let her down. Mr. Donut may have saved an ugly fight, tonight. 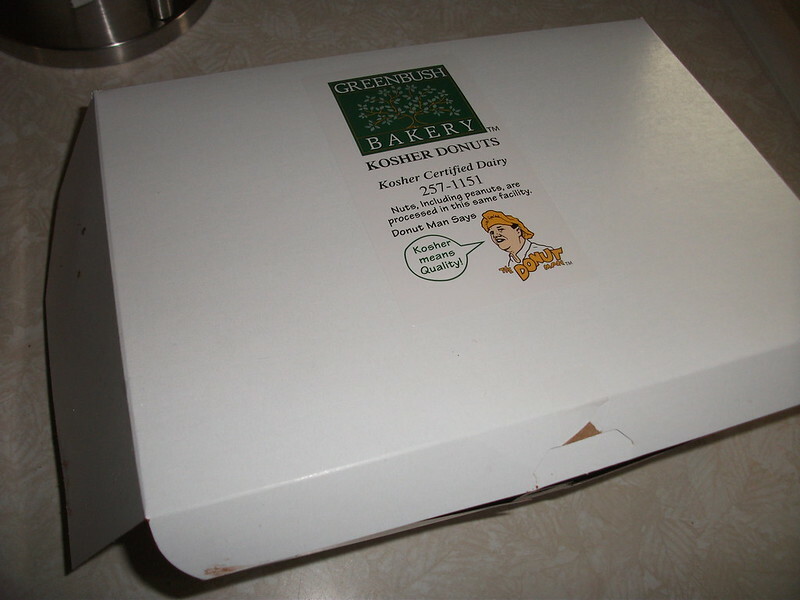 After exiting our last stop and realizing how bad I messed up we were stopped in the parking lot just before getting into our car by the owner of a well respected local bakery who insisted on giving us his last box of donuts out of the back of his luxury SUV. His name is Marv and he seemed a very nice man who was in a grand mood. Today was Good Friday so maybe he was out seeing clients and making deliveries and some friends along the way. 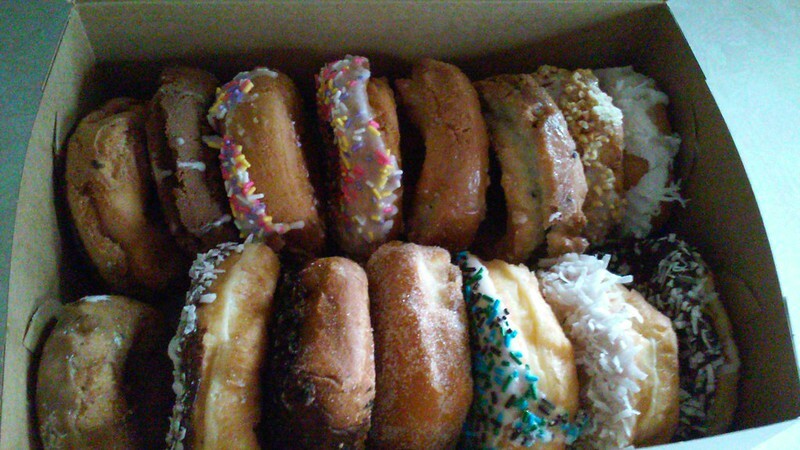 I don't know why, but the donuts were delicious! The (taped shut) box had 15 in it and you could tell by the freshness that they had been baked that morning. After we (me) ate more than a few and before sugar shock kicked in my wife smartly wrapped and froze half or more of them for another day. I was Homer Simpson today in more ways than one. Mmm, donuts... Not good.